A teenager died at the busiest border crossing in the world after drinking an amber-colored liquid in front of federal agents. NBC 7's Elena Gomez reports. A teenager died at the busiest border crossing in the world after drinking an amber-colored liquid in front of federal agents. The San Diego County Medical Examiner's Office has identified him at 16-year-old Cruz Marcelino Velazquez Acevedo of Tijuana. 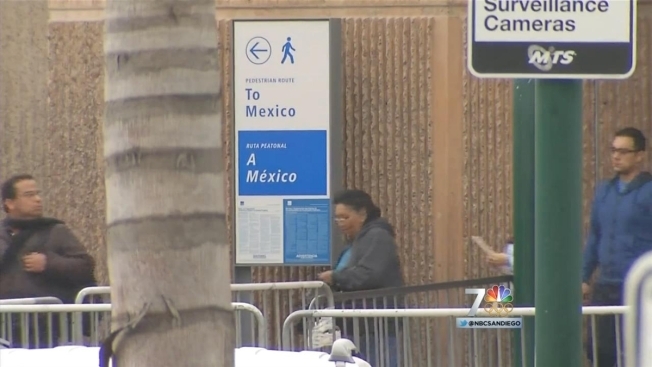 Acevedo walked into the U.S. from Mexico Monday evening using the pedestrian entrance at the San Ysidro Port of Entry. According to the ME, U.S. Customs and Border Protection agents stopped the teen because of a discrepancy on his Visa. At a secondary inspection point, officers asked him about the two containers he was carrying. Acevedo said the amber-colored liquid was juice and voluntarily took a sip, officials said. Agents said one of their drug-sniffing dogs signaled, so they took the teenager into custody. According to the ME's report, Acevdeo then became agitated and started screaming. San Diego police investigators said he admitted to agents that the liquid was a "chemical." Agents called paramedics, who had to sedate the teen before transporting him to the Sharp Chula Vista Medical Center. He was pronounced dead at the hospital, according to the ME. The ME did not release a cause of death. Agents said they ran tests on the liquid that tested positive for liquid methamphetamine. When asked about the potency of methamphetamine in a liquid form, a member of the UCSD Poison Control center said the substance can show life-threatening side effects within minutes because it hits the stomach quickly. SDPD Lt. Mike Hastings said toxicology test results are needed before investigators can know if the liquid caused the teenager’s death. San Diego police detectives investigate all cases and incidents where an individual dies while in law enforcement custody. Anyone with information about this incident can contact San Diego police homicide detectives at 619-531-2293 or Crime Stoppers at 888-580-8477.